We all know of the importance of recycling but do we actually know what can be recycled and how? Probably not. Below is a brief overview of what we think are the basics in the world of recycling. 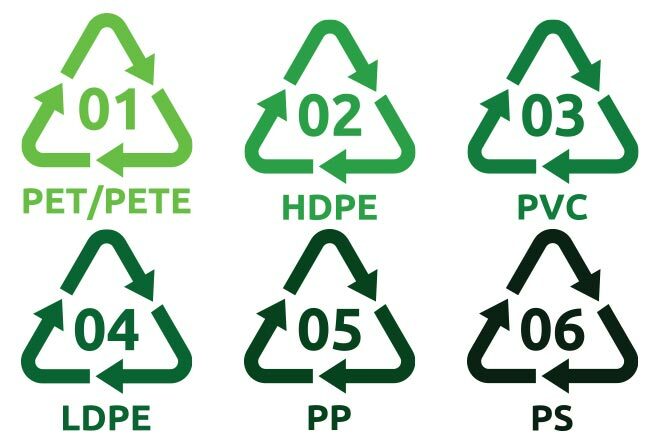 The Mobius Loop with a number in the centre and a letter code signifies what kind of plastic the packaging is made from. The code should help you identify whether it’s recyclable in your area. Polyethylene Terephthalate is one of the most common plastics that you will encounter. It’s usually what drinks bottles and tubs are made from. High-density polyethylene is another of the common plastics that you will find. It’s often used in toys, kitchenware and cable insulation. Polyvinyl chloride is what most modern window frames and doors are made from but is also used for wire insulation, flooring and footwear. The logo on plastic will often only have a ‘V’ below the symbol. Low Density Polyethylene is commonly used in toys, carrier bags and general packaging. Polypropylene is often used for products that are injection moulded and blow moulded and is widely recycled by thermoplastic-processing methods. Polystyrene is not just that white, fluffy packaging material that gets everywhere, it’s also the kind of material used for CD cases and cosmetic packs.